He once washed dishes full-time in a Connecticut trailer park. Now he uploads videos that break the 5,000,000-view mark in under three weeks. 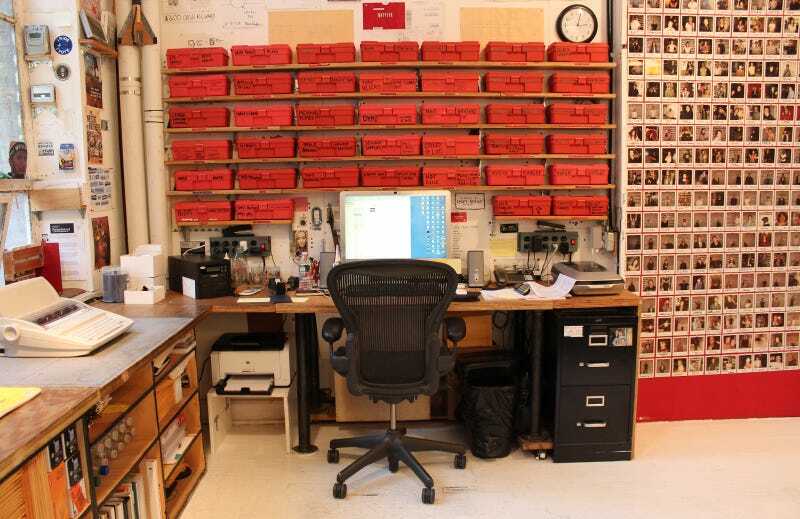 But when Casey Neistat isn't leaping into a sinkhole in Oman or stealing his own bike on the streets of NYC, he's busy working in this obsessively organized, fully functional, bare-bones 870-square-foot studio. This is Where the Magic Happens. These are our favorite temples of technology—secret spots where gadgets and culture converge. Welcome! When it comes to those assets, Neistat is no snob. He shoots white backgrounds on deli paper. He fixed a busted lens on his Canon T2i with a lid from a peanut butter jar. "I don't like anything that I use to be precious. This Canon is 25% of the cost of a 5D, but I think it's 85% the quality. If I were to spend four times as much, I would not get four times the quality," he said. His other gear is just as simple. Neistat prefers point-and-shoot cameras, like the Canon PowerShot S100, and iMovie. "I only edit in iMovie because the only edit tool I need is cut. I don't like aftereffects. I don't like any digital manipulation. If I can't accomplish it with the camera, I usually don't accomplish it," he says. His favorite SLR is the affordable, lightweight Canon EOS Rebel T3i, and he claims the $179 Canon 300HS is "dollar for dollar the best video camera money can buy." Other odds and ends include a trap door from a World War II shipping freighter—a $12 flea market find—transformed into a desk on wheels. He has an extensive VHS tape collection (left), his favorite being "The Life and Death of Colonel Blimp" (1943). Around the corner, a wall of tackle boxes contains everything from zip ties to sewing supplies. In a collection of 1,000 Polaroid portraits, Neistat says, every person who sets foot in the studio finds an acquaintance. Money Invested: "I couldn't tell you for all the tea in China," Neistat said. "I can tell you that it's way, way, way more money than is responsible." Prized Possession: "I definitely do not have one. Anything in here could be destroyed and I would not lose any sleep over it." Theft Deterrent: Surveillance cameras on the street, elevator, and entrance, connected via a 24-hour feed to an Air Cam Remote Webcam app for his iPhone. Near the entrance, just in case, Neistat keeps a wooden baseball bat. And an axe. On the Wish List: iPhone 5. "The iPhone is my favorite still camera." Want to suggest a place where the magic happens? Tell us about it.